Workers at Center Parcs Longleat Forest had a huge task to complete as they embarked on the final cleaning of the village’s newest addition – the largest AV-enabled raft ride in Europe. Armed with a multitude of different instruments to make sure they could reach spaces both high and low within the colossal cyclone – which will provide riders with a zero-gravity experience when the ride opens on 16th August – the ride cleaners had a difficult job on their hands. 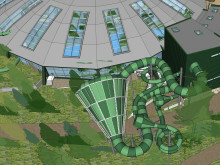 The adrenaline-fuelled waterslide additions, named Tropical Cyclone and Typhoon, both feature light experiences, offering nature-inspired themes for the rider to select ahead of the experience. The colossalTropical Cyclone is the largest interactive two- or three-person raft ride in Europe. 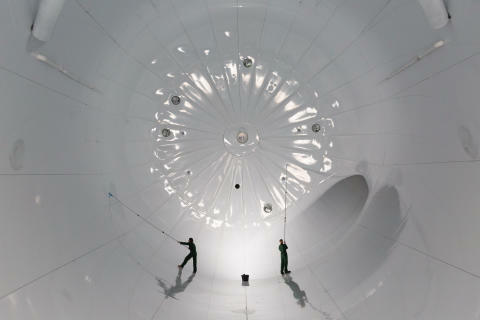 The unique ride features a cyclone with a spectacular diameter of 15 metres, which is the perfect canvas for the projections, lights and sounds displayed from the AV technology. Riders will be given the chance to choose from themes such as thunder, underwater, coral reef and waterfalls before heading into the exhilarating ride. Lasting an unforgettable 45 seconds and boasting a top speed of 40km/h, the ride offers 142 metres of twists, turns and sways with the giant cone drop tipping riders at an angle that gives riders a zero-gravity experience for a second before propelling them down the tube to a splash pool. Thrills don’t stop at the Tropical Cyclone, the new Typhoon also offers an exciting light experience which is sure to delight, with riders able to choose from one of five light experiences including treetops, seasons, Atlantis, rainbow and Aurora Borealis. A single or two-person ride, Typhoon whips riders through tubes and cones for up to a minute of drops and swings, reaching a top speed of 40km/h along its 140-metre length – giving the rider a truly amazing visual experience which will make the Typhoon an unforgettable ride to try. There are also two new areas included in the Subtropical Swimming Paradise revamp – a family water play area and a toddler play area and pool. These new areas will see families whizzing down brightly lit tubes, spraying each other with spouts and having fun in the water from the hidden giant tipping buckets, amongst much, much more. The Subtropical Swimming Paradise is the most popular place at all Center Parcs villages for families to spend a day of their break, with more than 90% of guests visiting the water wonderland to enjoy slides, a wave pool, Wild Water Rapids and toddler water play areas. 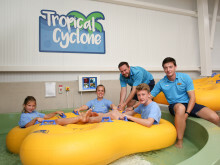 The Subtropical Swimming Paradise additions will open at Center Parcs Longleat Forest on 16th August with Ellie Simmonds, five-time Paralympic Champion, officially opening Tropical Cyclone and Typhoon. Typhoon ride is suitable for riders over 1.1 metres. Tropical Cyclone raft ride is suitable for riders over 1.22 metres. Center Parcs has been announced ‘Best Family Friendly UK Holiday Provider’ in the Tommy’s Awards for the fourteenth year in a row. The Subtropical Swimming Paradise at Center Parcs Longleat Forest is to open two new water rides, Tropical Cyclone and Typhoon, as well as a family water play area and a toddler pool. 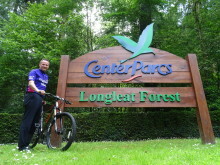 Andy De'Ath will pedal 575km across tough American terrain over five days to raise money for Together for Short Lives. Ellie Simmonds returns to Center Parcs to open the largest AV-enabled family raft ride in Europe.